PHOENIX — President Donald Trump plans to rally supporters in Phoenix next week, and Phoenix Mayor Greg Stanton is not happy about it. Trump's campaign announced the event Wednesday — a day after the president blamed "both sides" for weekend violence in Charlottesville, Virginia, between white supremacists and counter-demonstrators. The Aug. 22 rally will take place at the Phoenix Convention Center, the campaign said. "I am disappointed that President Trump has chosen to hold a campaign rally as our nation is still healing from the tragic events in Charlottesville," Stanton said in a statement Wednesday afternoon. "It is my hope that more sound judgment prevails and that he delays his visit." The president has been holding campaign-style events in Trump-friendly areas since he took office. Next week's rally will be his first in the West. Trump told Fox News in an interview this week that he may pardon former metro Phoenix Sheriff Joe Arpaio, who recently was convicted in federal court for disobeying a judge's order to stop his traffic patrols that targeted immigrants. A federal judge ruled in 2013 that Arpaio's officers had racially profiled Latinos. Arpaio, 85, is scheduled to be sentenced Oct. 5 and faces up to six months in jail. Attorneys who have followed the case doubt someone his age would be incarcerated, however. Critics say a pardon would amount to an endorsement of racism. "If President Trump is coming to Phoenix to announce a pardon for former Sheriff Joe Arpaio, then it will be clear that his true intent is to enflame emotions and further divide our nation," Stanton said. U.S. Rep. Raul Grijalva, D-Arizona, has announced he'll be leading a counter protest outside the Phoenix Convention Center during Trump's rally, the Arizona Daily Star reported Wednesday. In a six-minute video posted on YouTube, the newspaper said Grijalva called Trump unhinged and the congressman from Tucson labeled the president as a supporter of racists. 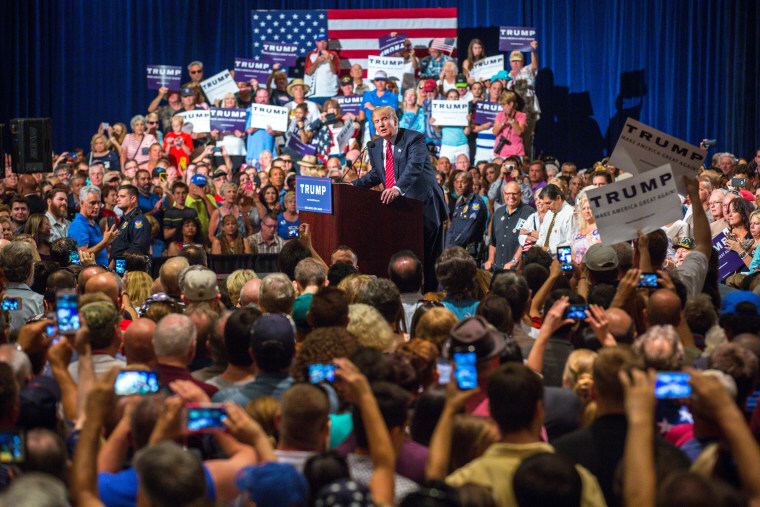 Trump last held a rally at the Phoenix Convention Center Aug. 31, 2016, ahead of the presidential election and detailed his plan to combat illegal immigration. He lambasted millions of immigrants as violent criminals and a drain on the U.S. government. Trump vowed at that time that no person living in the United States illegally would have a path to legal status without first leaving the country.